Level 1 – Classes are suitable for students with no little or no previous experience. Classes include slow paced instruction with a focus on proper alignment. Designed to develop a basic foundation and understanding of yoga postures, and to build baseline strength while gently increasing flexibility and improving circulation. Level 2 – Classes are suitable for students with previous yoga experience who feel comfortable moving through basic yoga postures and sun salutations. Level 3 – Classes are suitable for those with an moderate to strong personal yoga practice and fitness level. In hot vinyasa style yoga, students fluidly move from one pose to the next while connecting their breathing to their movements. This type of yoga is taught in a heated studio (85-90 degrees) which makes it a vigorous and revitalizing form of physical fitness. It incorporates strength, flexibility, balance, and physical and mental stamina in one session for the perfect blend of sweat and serenity! Without the heat, this vinyasa style class provides students the space to deepen their yoga practice as they are guided through a carefully planned set of asanas designed to promote strength, focus, endurance, and tuning in to one’s mind, body, breath connection. This is a vigorous class featuring advanced postures and deep stretching. Suitable for students with previous yoga experience. Restorative Yoga is a slower-paced, relaxing version of the popular physical and spiritual discipline of yoga. This class serves to relax the body and mind. We begin with a gentle warm-up and move into seated and reclined poses, using props for optimal support. The intention of this class is to improve circulation in the joints, revitalize tissues, improve range of motion, and relax! In gentle yoga flow we move slowly through asanas (poses) with the intention of evenly building strength and flexibility in the body. This class involves comprehensive queuing and one on one alignment coaching, making this a great class for beginners! Regular practice develops core strength, balance, flexibility, and increased mobility. Set to soothing traditional yoga music and practiced in a dimly lit room to promote relaxation. Buti is an Indian Marathi word that means “a cure that has been hidden or kept secret.” We believe EVERY woman has the power to transform and heal her body from within. Buti Yoga focuses on activating the Spiral Structure of the core to engage the deep abdominal muscles, stimulate the endocrine system, and activate kundalini energy. Classes utilize ancient pranayama and core engagement techniques seamlessly woven into a power yoga flow with bursts of cardio-intensive tribal movement. Experience Twisted Sister Yoga Studio’s unique set up and awesome sound system designed to “Rock the Mat” in these high-energy, transformative workouts set to rap, hip-hop, and tribal dance music! 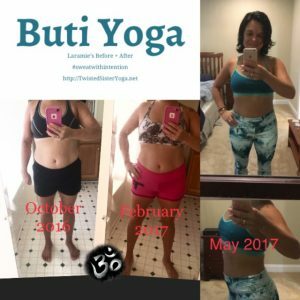 For more about Buti Yoga check out this video: What is Buti Yoga? Based on the elements of ballet warm-up exercises, yoga, and HIIT. The movements in Barre FusionFlow consist of high energy, low impact exercises, combined with traditional vinyasa. Designed to develop muscle tone and strength, while providing maximum calorie burning benefits. Burn up to 300 calories each 45 minute class. Bring water and a towel. Efficient, effective, and fun! Based on the Bikram Chouldry hot yoga style synthesized from traditional hatha yoga techniques and popularized beginning in the early 1970s. This 60 minute class consists of the same series of 26 postures, including two breathing exercises with the studio heated to 95 degrees. This class integrates kundalini yoga kriyas and breathing techniques into tradtional vinyasa flow to stimulate movement in the subtle energy body or chakra system while improving strength, flexibility, balance, mental focus, increasing oxygen in the body and brain, and calming the central nervous system. Following the movement portion of the class, students are guided into meditation with the option of working with mudras and mantras, and encouraged to sustain the meditation for twenty minutes. This is a healing practice that meets students where they are physically, mentally, and emotionally, and is suitable for all levels. Purchase a Class Pass or Become a Member!